Enjoy all the main Resort facilities of Red Sea Relax from your dorm or Saver rooms located in our separate 'Economy Annex' just 90 seconds walk from the main Resort entrance and reception. Our Dorm rooms and Saver rooms both fantastic panoramic views of the Dahab Bay from the shared rooftop terrace as well as shared kitchen, lounge and bathroom facilities. Dahab has something to offer for everyone from underwater yoga to mountain meditation, not to mention world class diving, snorkelling and trekking. Set against a backdrop of spectacular mountain landscapes, clear warm waters, and a colourful Bedouin culture the tropical climate ensures that your stay can be as active or tranquil as you like- year round! To facilitate some of the above our main Resort facilities (90 seconds away) also include our very own award winning PADI 5 Star National Geographic dive centre, a safari office, restaurant / bar, private beach and if the sea is too salty- a 100m2 pool! -Free all day Coffee, Tea and Water. For those who miss the 'Directions' button on the top of this page ask any taxi for the Lighthouse (El Fanar) and we are 100 meters down the beach promenade from the normal taxi drop off within Red Sea Relax Resort. 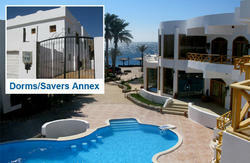 Look for the Red Sea Relax signs and the flags over our Dive Centre. 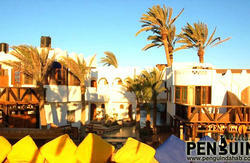 We look forward to welcoming you to Dahab Dorms- winners 'Best Hostel in Africa' 2009 and 2010! IMPORTANT NOTE 1: If arriving at the bus station a taxi should be about 15 LE. Please be aware of touts (on commission) who may attempt to take you to another Hostel. IMPORTANT NOTE 2: Free WiFI access is available throughout the Resort public areas. It does not work in the dorm rooms. Please note in Egypt as a whole, internet access can sometimes be intermittent- we cannot guarantee access. Should you have difficulties, please ask a member of staff and we will be delighted to loan you a 'USB dongle' free of charge subject to availability. IMPORTANT NOTE 3: Due to strict local Egyptian regulations it is not authorised for Egyptian residents to book into accommodation 'shared' with International guests. We are routinely checked by Police authorities on this matter. If you miss this important notice you will of course be refunded your deposit fee. If arriving to the Dahab bus station a taxi should be no more than 15 LE (per car- not per person), for the 5 minute trip to the Lighthouse. As mentioned on the main page- please be aware of touts (on commission) who may attempt to take you to another Hostel.